It's been a busy few days for Metallica. On the one hand, they've released their best and most talked-about LP for 17 years and it's topped charts on either side of the atlantic, selling hundreds of thousands of copies in the process. 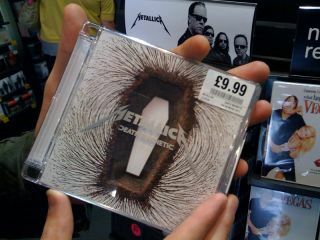 However, to a band who have faced more than their fair share of drama and controversy over the years it will probably come as no surprise that the release of Death Magnetic hasn't gone by without a hitch or two. Yesterday, we revealed the growing disquiet surrounding the audio quality of the CD release, along with the revelation that many fans seem to prefer the way Death Magnetic sounds in the Guitar Hero 3 video game. There's even a petition demanding that the album be remixed or remastered. As the debate rumbles on in the online community and starts to be picked up by the mainstream media, it's surely high time that somebody in the Metallica camp had something to say to all of the fans who love the songs on Death Magnetic but feel short-changed by a distorted, punishingly loud CD master. "As far as i'm aware the band are happy with the quality of the album and everyone I know who has it, thinks it sounds fantastic." Metallica have been in the UK for a couple of days promoting Death Magnetic with a busy promotional schedule including a live date at the O2 Arena (read our review here) and an appearance on Later...With Jools Holland. "I've seen all the stories, and will ask if anyone wants to comment, although the band tend to deal with questions via their website, and comment on there. As far as i'm aware the band are happy with the quality of the album and everyone I know who has it, thinks it sounds fantastic. "It looks like the album will be number one again in the UK next week, which I guess wouldn't be happening if people felt the album wasn't up to scratch." It seems that for the time being, fans will just have to sit tight and wait for the band to respond.